During my training to become a lactation consultant, IBCLC, I was inspired to start my own practice in which I can put all my knowledge and experience to use to help mothers like you to have as successful a breastfeeding experience as possible. This list is not at all complete so if you have any other question in any phase of breastfeeding, please contact me. Tackling challenges as early as possible will help prevent problems that are harder to solve! Consultations are scheduled, preferably on weekdays but when necessary evenings and weekends are also an option. When I visit you and your baby in your home, I bring baby scales with me. Knowing the baby’s actual weight can be very helpful in assessing the problem. I may also provide you with handouts that address the breastfeeding issues you are dealing with. If I can reach your home within 30 minutes from my address with normal traffic, then you live within my work area. If my travel time is more than 30 minutes, I charge €2,50 for every additional five-minute period that I travel. I do home visits in: Aerdenhout, Akersloot, Alkmaar, Amsterdam (Noord, Osdorp en Sloten), Badhoevedorp, Bennebroek, Beverwijk, Bloemendaal, Castricum, Cruquius, Driehuis, Haarlem, Haarlemmerliede, Halfweg, Heemskerk, Heemstede, Hillegom, Hoofddorp, Limmen, Lijnden, Nieuw-Vennep, Overveen, Santpoort, Spaarndam, Uitgeest, Velsen-Noord, Velsen-Zuid, Velserbroek, Vijfhuizen, Wijk aan Zee, IJmuiden, Vogelenzang. When you are mobile again with your baby, you are welcome to plan a consultation in my office in IJmuiden. 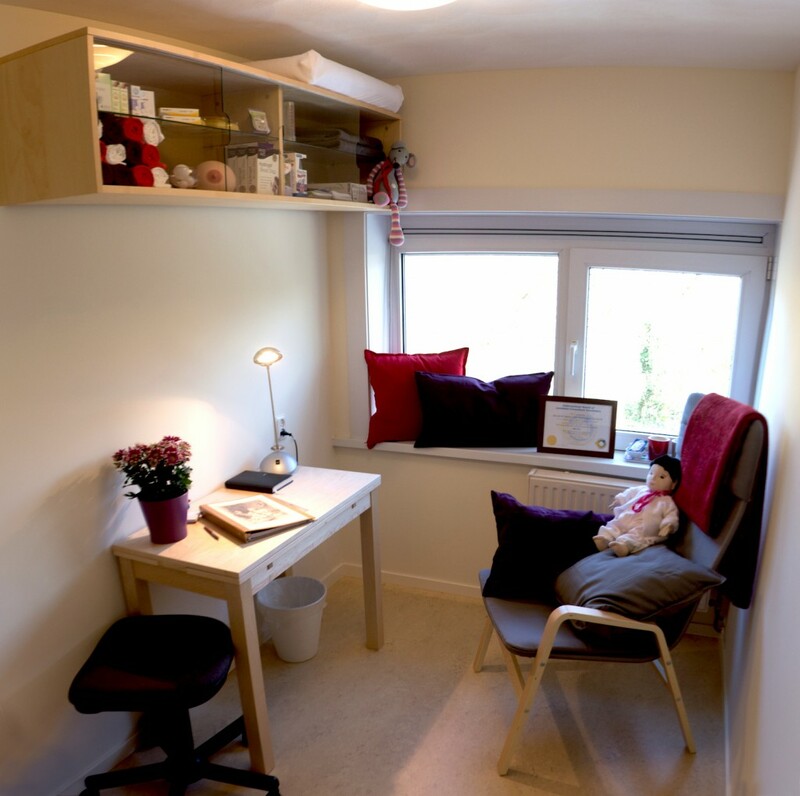 In my home, I have created a comfortable office space where I can help you and your baby with all your breastfeeding issues. There is a reduced rate for consultations that take place in my office. I speak Dutch and English fluently. If the situation calls for it, I am flexible and will find a means of helping you understand what I am explaining. In order for me to help you and for the financial settlement of our contact/agreement I need some personal data from you. This mainly means your address, emailaddress and telephone number. These data will be written down on paper and processed in the report I write of the consultation. As soon as I finish writing the report, I file the anamnesis on paper in a folder that I keep behind locked doors. The computer I work on is password protected for others. Client data will never be shared with others without your consent. The report is a reflection of all data that I have of you. I ask you to read it carefully and let me know if you want anything to be changed or deleted. Communication goes through e-mail and/or telephone. Your permission is required for me to send you the report as a PDF file by e-mail.